Unicaja Malaga shook things up in Top 16 Group E with a 74-77 victory over Real Madrid at the Community of Madrid Sports Palace in the Spanish capital. Luka Zoric went wild with 21 points, 12 rebounds and 2 blocks to lead Unicaja to its fourth straight road win and to deny – at least for another week – a playoff berth for both Madrid and Anadolu Efes. Unicaja improved to 6-5 and sits in fifth place in Group E – one win behind Panathinaikos Athens for the fourth ticket to the playoffs from the group. Madrid slipped to 9-2 and into a tie for first place with Anadolu Efes Istanbul. The hosts took control with a 15-2 first quarter run and led 40-32 at halftime, but Unicaja rallied back with 13 unanswered points in the third quarter. Madrid clawed its way back to within 1 late in the fourth. Down the stretch, Zoric and Fran Vazquez came up with big plays on defense and Krunoslav Simon and Zoric sealed the win with clutch free throws. Simon tallied 18 points for the winners and Vazquez added 10 points. Sergio Rodriguez paced Madrid with 17 points and 6 assists, Nikola Mirotic added 12 points and 8 rebounds and Jaycee Carroll netted 10 in defeat. Madrid was without Rudy Fernandez due to back spasms. Zoric started strong with a baseline jumper and after Rafael Hettsheimeir made free throws, a Zoric slam made it 2-6. Mirza Begic threw in a hook, but Krunoslav Simon heated up with a triple and a turnaround jumper to make it 4-11. 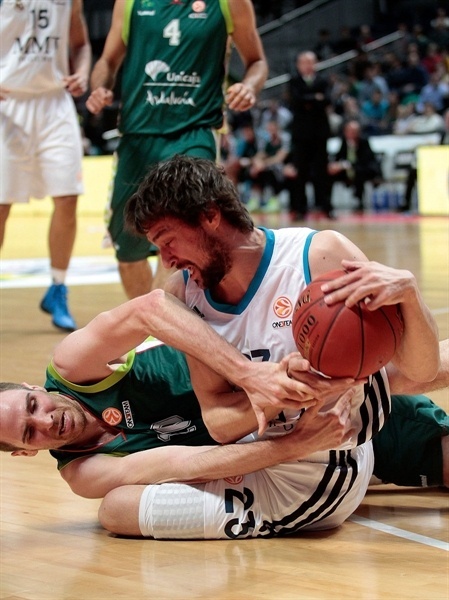 Madrid stayed close thanks to a Sergio Llull drive and a bucket by Hettsheimeir. Begic completed the comeback through Begic to go up 12-11, but on the ensuing play, Zoric came through with a basket-plus-foul. 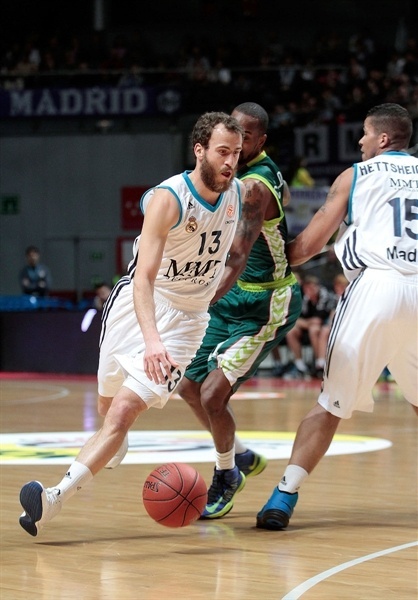 Llull continued to rally the hosts with a big three-pointer before Hettsheimeir added a jumper for a 4-point lead. 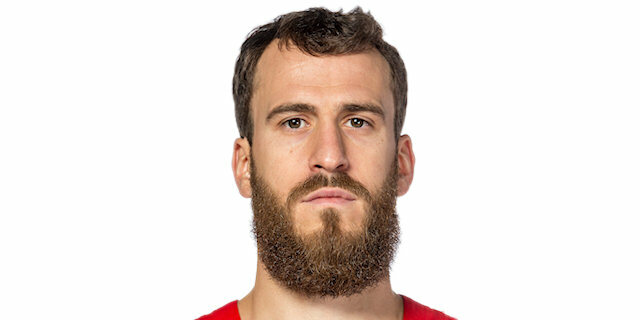 Sergio Rodriguez in transition completed a 15-2 Madrid run. 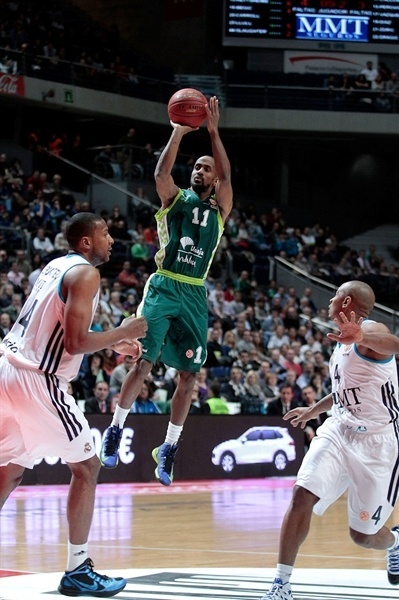 Simon ended the Unicaja drought, but Rodriguez drilled a jumper for a 21-15 lead through 10 minutes. Txemi Urtasun opened the scoring for Unicaja in the second quarter, but Felipe Reyes inside and Nikola Mirotic with a fine three-point play kept the momentum white. Rodriguez and Marcus Slaughter connected to take the hosts’ lead to double figures. First Rodriguez found the big man for a pretty alley-oop slam, then Slaughter’s block led to a Rodriguez layup and a 30-18 advantage. 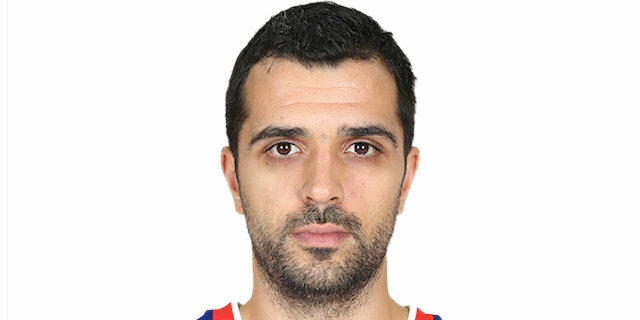 Kosta Perovic muscled his way to a three-point play inside, but the visitors had trouble stringing points together. Dontaye Draper found Slaughter for another alley-oop. After a Perovic tip-in, Carroll got on the scoreboard with a triple. Remained strong at both ends and Earl Calloway made it 35-27 from the line. 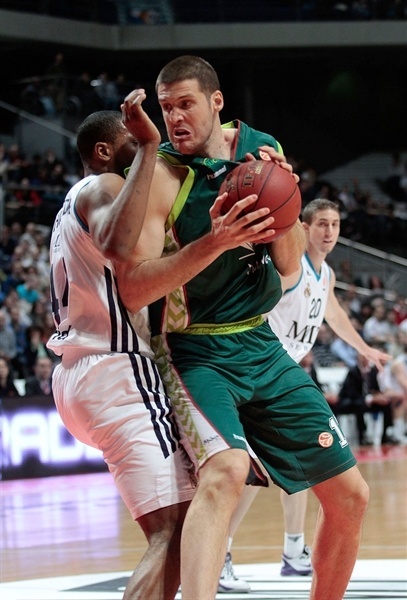 Carroll twice re-extended the lead to 10, but Unicaja refused to quit. Urtasun fed Fran Vazquez for an alley-oop inside the final minute, which left the scoreboard showing 40-32 at the break. Malaga picked up the pace to start the second half and after a Simon triple and Zoric free throws, it was a one-possession game. Zoric went through Begic to make it 42-41. 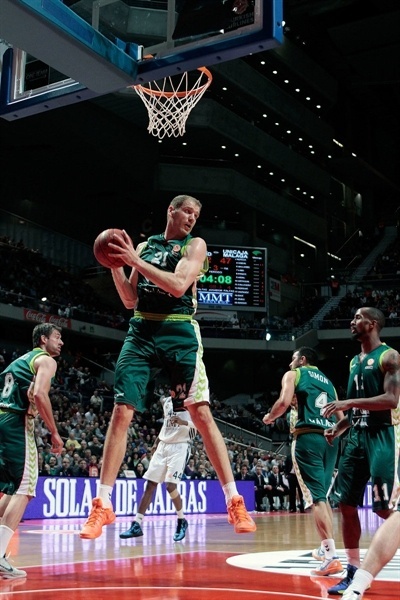 A Zoric rejection led to a Simon three-pointer for Unicaja’s first lead since the first quarter. Then a Zoric steal resulted in an Andy Panko triple, making it 11 unanswered points for a 42-47 lead. Despite a timeout, Madrid remained cold on offense, but tightened up its defense. Calloway added a basket before Carroll ended a six-plus-minute scoring drought with a much-needed three-pointer. 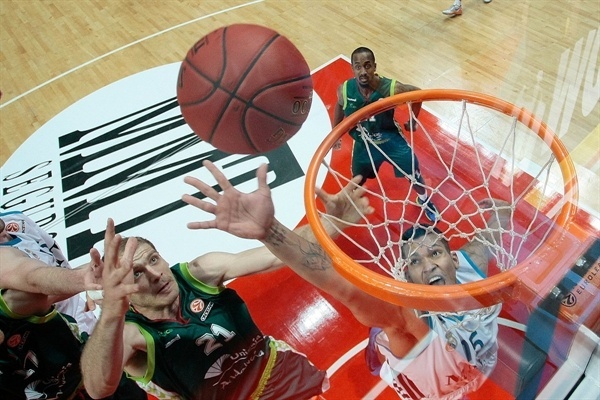 Slaughter and Zoran Dragic exchanged words and received technical fouls. Zoric and Mirotic traded points from the line before Calloway fed Zoric for a vicious two-handed slam and foul. Mirotic responded with a basket on the offensive glass, but it wasn;t long before Calloway drained a triple from the corner for a 9-point Unicaja lead. Llull trimmed the gap to 53-60 at the end of the quarter. Mirotic got the crowd involved with the first basket of the fourth quarter, however Simon and Zoric answered back. A Zoric slam made it 55-66 and caused Madrid coach Pablo Laso to call for an urgent timeout. Felipe Reys came through with a mid-range jumper and Rodriguez drained a long jumper. Rodriguez remained sharp as he carved up the Unicaja defense twice to bring his team within 3 midway through the fourth quarter. As the tension grew, so did the amount of turnovers. Some slick passing led to a Vazquez layup and a 63-68 Unicaja edge. Panko fouled out. With three-and-a-half minutes to go, Rodriguez nailed a pull-up three-pointer to make it 67-68. Marcus Williams stepped up with his first points, a clutch triples, then Zoric rose to block Rodriguez and protect the lead. Rodriguez came back with 2 free throws to make it a 1-point game. But Madrid missed twice and Williams broke the Madrid defense with a laser pass to Vazquez for a 69-73 lead with 38 seconds remaining. Carroll missed a runner and Zoric claimed the rebound. Reyes fouled out for Madrid, Williams missed twice. Rodriguez fed Slaughter to trim the deficit to 2 with 18.5 seconds left. This time Madrid fouled Simon, who went to the line and sank 2. After Vazquez blocked Rodriguez, Zoric sealed a big win with 2 from the line. 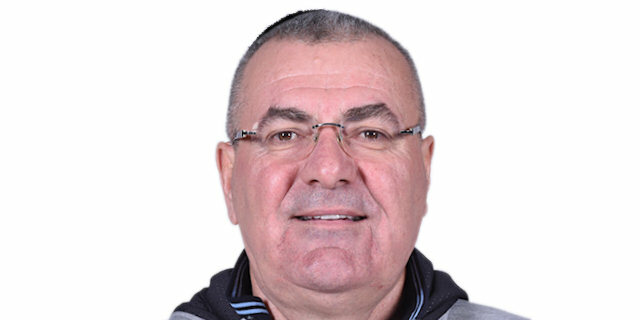 "First of all, congratulations to Unicaja for its win. 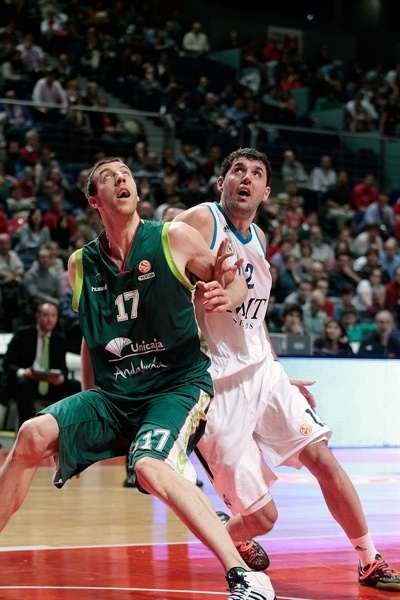 Our third quarter was not good and allowed Unicaja to get a good lead. Unicaja handled that lead very well during the rest of the game. Even so, we reached the final minutes with chances to win the game, but both teams know each other very well already and we were not intense all 40 minutes long. 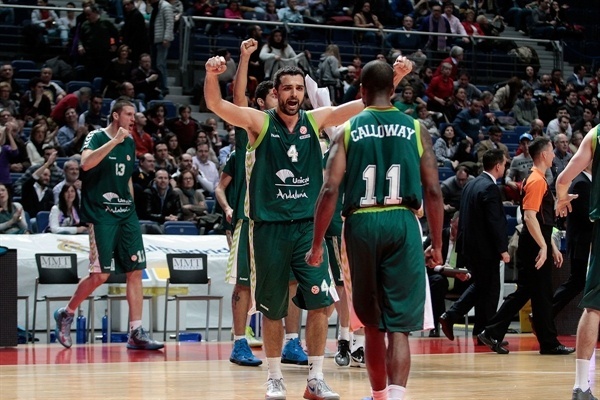 Like I said, Unicaja handled its lead very well and won the game." "It was a make-or-break game for us - just like all the games remaining. This win is very important. We didn't play well in the first half and I believe it was because we have faced Madrid three times this season and it was hard for us to get into the game. We were lucky to be trailing by just 8 points at halftime. Everything changed after the break; we had six very good minutes in which Madrid was scoreless. Their zone defense gave us a lot of problems, as we had done well in offense before that. We managed to get the win, which is very important. We were not consistent all 40 minutes, but managed to win the game." "We had a good first half; we played the right way in the opening 20 minutes. We struggled throughout the third quarter and that cost us the game. We tried to change things in the fourth quarter, but trailed all the way. Unicaja had a high confidence and made some key shots. We have to be more consistent for 40 minutes. This was an important game for us - we have Efes right behind us and CSKA not too far away. Our goal is to get the home-court advantage in the playoffs and this game was important to achieve that goal. There are three games left, two of them at home, and we can win them all. Our fans were great; they helped us to return to the game." 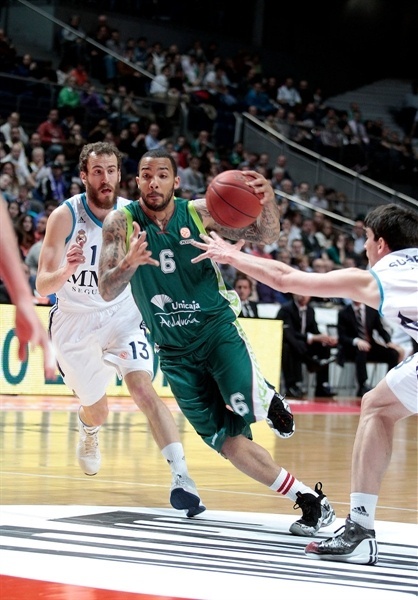 "Unicaja was the best team tonight. We have to play at the level we did two and three weeks ago so that games like this are not that difficult for us. It is a tough loss, but we will fight to win the next game. It is a shame to lose at home for the first time this season. We are in a good place, but we will see what we did wrong in practice and this will make us a better team. It hurts, but we must keep fighting to get the home-court advantage in the playoffs. This cannot happen again. We have some home games and have to make the most out of them." "After three losses against Real Madrid, we finally managed to beat them. The key to this win were the points we scored through open shots and the great defense that we had at times. We played a horrible first half, but managed to win the game in the second with great defense, giving 100% effort and intensity. Our future is a bit brighter than before the game. We have options to reach the playoffs, but need to go game by game. This team needs more games like this to make it to the playoffs."